Seann Walsh’s girlfriend Rebecca Humphries has insisted “I am not a victim”, after he admitting kissing his Strictly Come Dancing partner. Comedian Walsh and Katya Jones, who is married to fellow Strictly professional Neil Jones, apologised after they were pictured kissing on a night out. Humphries tweeted she had thought something was going on – but Walsh had called her a “psycho” for saying so. A representative for Walsh declined to comment, and neither has the BBC. In the statement the actress said: “It’s incredibly good of Sean(n) and Katya to apologise in the media. Humphries said the pictures of the pair were taken on her birthday and she was alone at home when Walsh texted to say they were going for “one innocent drink”. “We spoke and I told him, not for the first time, that his actions over the past three weeks had led me to believe something inappropriate was going on,” she said. She said the incident had “served to remind me that I am a strong, capable person who is now free; and no victim”. “I have a voice and will use it by saying this to any woman out there who deep down feels worthless and trapped with a man they love,” she added. The photographs of the pair, reportedly taken on a night out in London last week, were first published in the Sun on Sunday. Jones, 29, said the kiss was a “one-off mistake after some drinks”. 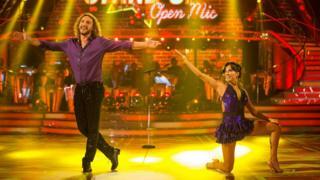 “I’m so sorry about any offence or hurt I may have caused with my actions,” the dancer tweeted.